For the Quartodecimans, the 14th was the first high Sabbath and the first and great day of Unleavened Bread. These statements have been misunderstood by some historians who unfortunately have failed to recognize any system other than the Hasidic practice of the 15th as the Passover high Sabbath. As a result, these scholars believe that some of the Quartodecimans have mistakenly dated the murder of the messiah to the 15th of Nisan rather than to the 14th and that the 15th was the Quartodeciman great festival day (high Sabbath) of Unleavened Bread. The context for the above statements from Apollinarius of Hierapolis and Melito of Sardis proves just the opposite! To begin with, both kept the 14th and ardently defended the Quartodeciman view held by the Asiatics.10 The Asiatics believed that the messiah died on the same day that he ate the Passover, i.e., the 14th, and not on the 15th (Hebrew reckoning). Meanwhile, in a reference to the great controversy that raged in Laodicea during the spring of 167 C.E.,11 Apollinarius of Hierapolis, rather than supporting, actually chastises those who held to the notion that the 15th was both the great festival day (high Sabbath) of Unleavened Bread and the day on which the messiah was murdered. He describes them as ignorant people who had stirred up disputes about these things and were in need of instruction. Apollinarius of Hierapolis instead argues that it was on the 14th that the messiah ate the Passover. For Apollinarius, the New Testament “seems to disagree” with the advocates of this view because the day that the messiah ate his Passover meal is defined in Matthew and other Synoptic texts as “the first day of unleavened bread,”14 and therefore a high Sabbath, being the first day of the seven days of Unleavened Bread. Interesting confirmation of this construct comes in the ancient Syriac text of the Sinaitic Palimpsest, which reflects the eastern view. In its version of the book of Mark, the messiah’s death on the 14th of Abib is said to have taken place “on the Sabbath.”19 The only Sabbath possible for the day of the messiah’s death, since he was only buried for three days and was raised immediately after a weekly Sabbath day,20 is a high Sabbath! The noted scholar Stuart G. Hall recognized the contradiction created when one tries to identify the 15th with the great festival day (high Sabbath) of Unleavened Bread adhered to by these Quartodecimans. Therefore, the Quarto­deciman great festival day of Unleavened Bread, referred to as the day of the messiah’s death, was the 14th. Scriptures command that the last day of the seven days of Unleavened Bread is also a high Sabbath.23 There is no direct record discussing the Quarto­deciman obligation to keep this high Sabbath. Early in the second century C.E., a variation of the Quartodeciman view was created among some of the assemblies in the West (System D). It was fully accepted in Alexandria and Rome. The Christians supporting this construct, not surprisingly, retained the Aristocratic view that the seven days of Unleavened Bread extended from the beginning of the 14th until the end of the 20th day of the first moon. Yet, for reasons we shall deal with in a later post, they differed from their Quartodeciman brothers in that they observed the first day of the week within these seven days, the day of the messiah’s resurrection, as the Eucharist, Passover supper, and high Sabbath (great festival day). 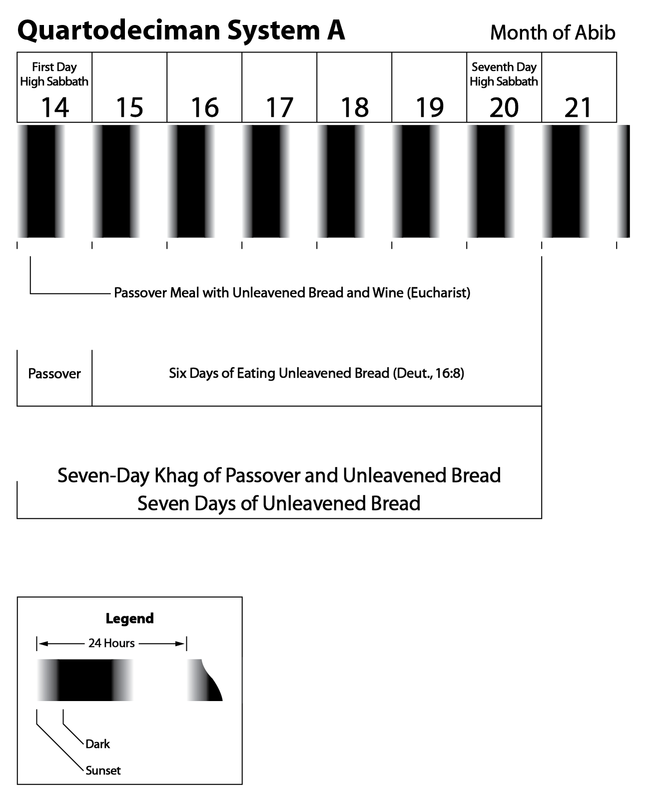 What has been continuously overlooked is the fact that both of these groups (the Quartodeci­mans of System A and the quasi-Quartodecimans of System D) observed the seven-day festival of Unleavened Bread from the beginning of the 14th until the end of the 20th of the first moon. The source for this seven-day view was the common fountain of the teachings of the apostles and the New Testament. System D differed from the conservative Quartodecimans (System A) in that its advocates observed only the first day of the week, the day of the messiah’s resurrection, as the Passover festival. It is also upon this date that the Christians commemorated the resurrection of the messiah.27 Those following System D ignored the Aristocratic practice of observing the 14th and 20th days of Abib as high Sabbaths. 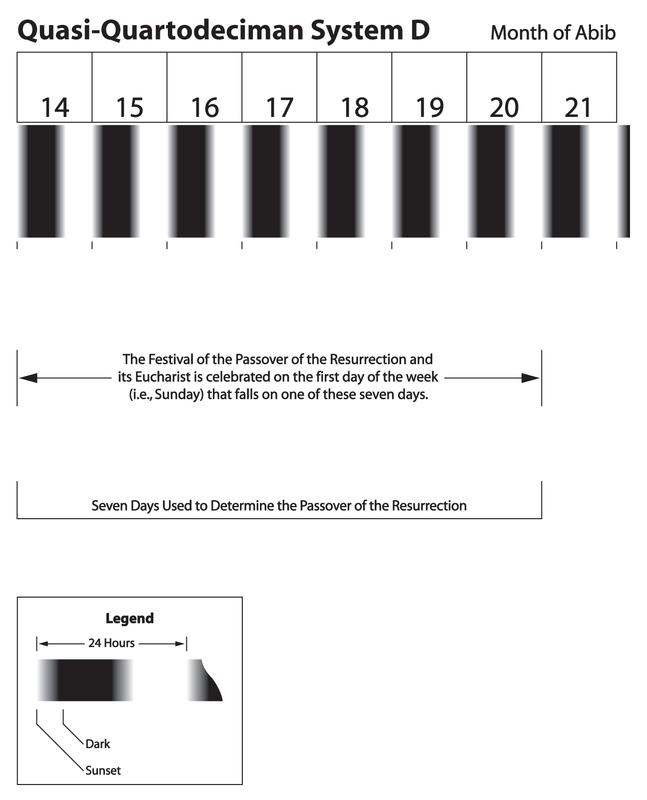 Yet the western method for calculating the day of the Passover of the resurrection still required the use of the seven days of Unleavened Bread as practiced by the original assemblies following Yahushua. The “resurrection day” would always be placed in conjunction with the seven days of Unleavened Bread. Therefore, whenever the first day of the week fell during that seven-day period of Unleavened Bread it became the Passover of the resurrection for these western assemblies. Irenaeus relates how Polycarp “came to Rome and conversed with Anicetus about some difficulty as to the day of the Passover.”29 He does not say “difficulties” in the plural, but as to a singular difficulty. There is not even a suggestion in these records that the bishops disagreed with regard to chronology over which days represent the seven days of Unleavened Bread. Just the opposite is true! The only way that Anicetus could peaceably yield the Eucharist, which for Eusebius meant the mystery of the cup and bread, to Polycarp, who utterly refused to celebrate it on any other day but the 14th, is if the assembly at Rome was observing the 14th as one of the seven days of Unleavened Bread. It is also important to notice that there was no objection based upon fasting, which became a major issue a few decades later, or any other such hindrance to either party taking the Eucharist. The debate between the Audians (fourth century C.E. advocates of System D)34 and Emperor Constantine adds further proof that System D was the original western view. The Christian Judaeans of the early assemblies (those “from the Circumcision”), as with all members of the early assemblies, were Quartodeciman-based. The Audians interpreted this to mean that they should observe Passover Sunday during the seven days of Unleavened Bread that were observed by their Quartodeciman Christian brothers, those converted from among the Jews. Further, that those in the West during the second century C.E. followed System D is directly asserted by the Audians. We are told that the Audians kept their Passover during the period when the Jews were keeping their days of Unleavened Bread (i.e., the Jewish eight days of unleavened bread, which starts with the 14th day of the first moon). 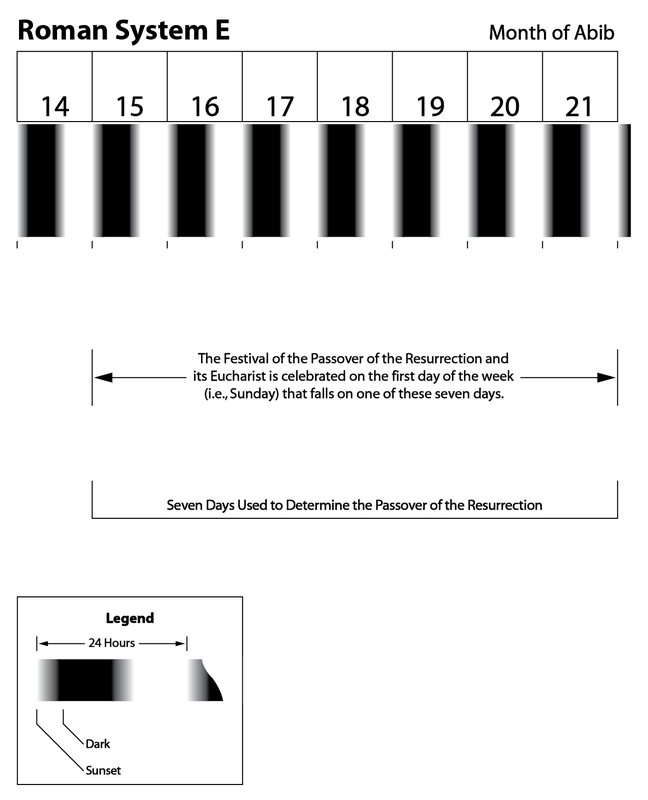 For both the Quartodeciman view (System A) and the quasi-Quartodeciman (System D), the apostles are the common source for their understanding of the 14th as the first of the seven days of Unleavened Bread. To demonstrate, the Quartodeciman named Polycrates reports that the apostles Philip and John taught the assemblies in Asia how to observe the Passover. • The Quartodecimans observed the 14th of Abib as their great festival day (high Sabbath) of Passover and the first day of Unleavened Bread. • It is also understood that the quasi-Quartodecimans kept the same seven days of Unleavened Bread that were observed by the early Quartodecimans. • Finally, both the early Quartodecimans and the quasi-Quartodecimans of System D deferred to the apostle John as their ultimate authority for when one was to observe the seven days of Unleavened Bread. To fully establish beyond any doubt that the seven days of Unleavened Bread for both the Quartodecimans and quasi-Quartodecimans extended from the 14th to the 20th, our next post shall examine the records from several important quasi-Quartodeciman sources, including their most notable advocate, Anatolius of Alexandria. Be sure to continue your investigation with more evidence presented in 24. Passover – Anatolius Speaks! 1 Lev., 16:31, 23:24, 26-32, 39, all demonstrate that sacred gatherings are also called sabbathon days (i.e., high Sabbaths). 2 Exod., 12:16; cf., Lev., 23:5-8; Num., 28:16-25. 3 Chron. Paschale, 1, pp. 13f. 6 Heracleon was a disciple of Valentinus in the second half of the second century C.E. The Valentinians were Gnostics, explaining everything as symbols of some Gnostic doctrine. Yet their observance of Passover was, as with the earliest Christian practice, Quartodeciman-based. 7 Chron. Paschale, 1, pp. 13f. Heracleon, frag. 12; Origen, Com. John, 10:116f. 9 For example, see EWJ, p. 19; MSSP, pp. 181-183; PUO, pp. 43f. 10 Melito, bishop of Sardis, wrote two books entitled On the Passover (Jerome, Lives, 24; Eusebius, H.E., 4:26:2). Two fragments from the works of Apollinarius of Hierapolis remain in the Chron. Paschale (1, pp. 13f). Each man addressed apologetic arguments of their own to Emperor Marcus Aurelius Verus (161-180 C.E.) (Eusebius, H.E., 5:24:1f). Both men are lauded as leaders of Asian assemblies who kept the 14th as the Passover supper (Eusebius, H.E., 5:24:5f). 11 Melito, frag. 4, writes, “Under Servillius Paulus, proconsul of Asia, at the time when Sagaris bore witness, there was a great dispute at Laodicea about the Passover, which had coincided according to season in those days.” The most likely date, as discussed by Stuart G. Hall (Hall, Melito, pp. xxi-xxii), is the year 166/167 C.E. (May reckoning). Since this event coincided with the season in those days, we would understand that the debate took place in the spring of 167 C.E. Also see Eusebius, H.E., 4:26:3; cf., EEC, p. 141, 26. n. b; JTS (NS), 24, p. 76; JTS, 25, p. 254; BCal, p. 160. 12 Quoted in Chron. Paschale, 1, pp. 13f. 13 Chron. Paschale, 1, pp. 13f, cf., LXX Exod., 12:11, 26-27, 48. 14 Matt., 26:17-21; Mark, 14:12-18; Luke, 22:7-16. 15 Chron. Paschale, 1, pp. 13f. 16 The surviving text has καὶ (kai; and). Louis Duchesne proposes that the original had ᾗ (hêi; on which), i.e., “on which (day) he suffered” (RQH, 28, p. 10, n. 4). 18 JTS, 25, p. 262. 19 Sin. Pal., at Mark, 15:43. 20 Matt., 28:1; Mark, 16:9; Luke, 24:1. 21 Hall, Melito, p. 43, n. 45. 22 See above n. 2. 24 Chrysostom, Adver. Jud., 1 (PG, 48, p. 848); and see comments 22. Passover – The Quartodecimans II. For evidence that the Quartodecimans observed the last day of Unleavened Bread as a great or high Sabbath see FSDY, App. F and App. G.
25 See next post 24. Passover – Anatolius Speaks! 26 Lev., 23:4-21; Num., 28:16-31; Deut., 16:6-10. 27 This view is based upon Matt., 28:1-10; Mark, 16:1-9; Luke, 24:1-7; John, 20:1-19. 28 Eusebius, H.E., 4:14:1, 5, 5:24:16f; Irenaeus, Ag. Her., 3:3:4; Jerome, Lives, 17. Jerome, Euseb., yr. 2173 (Oly. CCXXXIIII) attributes Anicetus a position of leadership for 11 years. He then places the beginning of the next bishop, Soter, to the ninth year of Verus (Jerome, Euseb., yr. 2185 [Oly. CCXXXVII]). Eusebius supports this with the statement, “Now by this time, εἰς ὄγδοον ἐλαυνούσης ἔτος (eis ogdoon elaunouses etos; at the driving out of the eighth year) of (emperor Verus) showing forth his leadership, Soter succeeded Anicetus in the bishopric of Rome, who had served in all eleven years.” (Eusebius, H.E., 4:19). That ἐλαυνούσης (elaunouses) means “to drive away, expel . . . to drive to extremities,” see GEL, p. 248. The eighth year of Verus was 168/169 C.E., March reckoning. Counting the eighth year of Verus as the 11th year of Anicetus, we are brought back to the 20th year of Antoninus Pius (157/158 C.E., July reckoning). This detail is supported by the statement that Soter, who “ended his life within the eighth year of his leadership,” was succeeded by Eleutherus in “the 17th year of Emperor Antoninus Verus” (Eusebius, H.E., 5:1:1; cf., Jerome, Euseb., yr. 2193 [Oly. CCXXXVIII], i.e., in 177/178 C.E., March reckoning). Once again, this places the first year of Soter in the ninth year of Emperor Verus, in turn placing the first year of Anicetus in the 20th year of Emperor Pius. Irenaeus relates that Polycarp came to Rome to converse with Anicetus “about some difficulty as to the day of the Passover” (Eusebius, H.E., 4:14:1). They discussed the matter fully but were unable to change one another’s opinion (Eusebius, H.E., 5:24:16). The most appropriate time for this visit from the leader of the eastern assemblies to Rome would have been shortly after Anicetus obtained his post. We also know that they partook of the Eucharist together, which demonstrates that Polycarp was in Rome during the spring Passover season (Eusebius, H.E., 5:24:17). These details indicate that Polycarp could not have been in Rome any earlier than the spring of 158 C.E., not long after Anicetus became sole bishop and leader of the Roman assembly. 30 That the Eucharist, the cup and bread, and Passover supper all became the same thing to Eusebius and those following System E, see Eusebius, Pas., 7-11. The Quartodecimans, on the other hand, as demonstrated by the Didache, followed the original meaning of Eucharist, which is the Jewish berakah or giving of a blessing and thanks before a meal (SNT, 6, p. 276; LD, pp. 377, 399). 33 Eusebius, H.E., 5:24; Irenaeus, frag. 3. 34 RAC, 1, pp. 910-915; EEC, pp. 169f, 64, n. a. 38 Eusebius, H.E., 5:24; Jerome, Lives, 45. This entry was posted on 02/05/2013, 12:17 pm and is filed under Calendar, Easter, Feast Days, High Sabbaths, Holy Days, Passover, Quartodecimans, Religion, Scriptural Calendar, Tekufa, Tekufah, Tequphah, Tequphath, Unleavened Bread, Vernal Equinox, Yahweh. You can follow any responses to this entry through RSS 2.0. You can leave a response, or trackback from your own site.